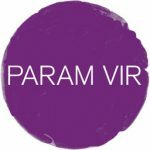 Param Vir, born in Delhi, India, is among the most gifted of contemporary composers for whom the example of the 20th-Century modernist masters remains a valid source of creative expression and renewal. In particular, his three operas are acknowledged to be fruitful contributions to the direction of music-theatre of the last two decades, as compelling in their theatricality as in their commitment to compassion and self-discovery. Vir’s early years in India and subsequent move to the rarefied milieu of European new music are in themselves testimony to his sense of dedication. He studied the piano from the age of 9, but read philosophy at Delhi University and pursued composition privately until 1983, when a scholarship initiated by Sir Peter Maxwell Davies enabled him to attend the Dartington International Summer School. In 1984, he began formal composition studies at the Guildhall School of Music & Drama with another influential mentor, Oliver Knussen. The award of the 1987 Benjamin Britten Composition Prize for Vir’s Before Krishna for strings announced the arrival of a major new talent. More prescient still in its setting of Tagore, translated by William Radice, was the London Sinfonietta Voices commission Brahma Vishnu, Shiva, premiered in 1988. Vir chose another Tagore-Radice text as libretto of his first opera, Snatched by the Gods, begun that year in response to a request from Hans Werner Henze for a new work for the Munich Biennale. With his second one-act opera, Broken String, to a libretto by playwright David Rudkin, it was triumphantly premiered at Amsterdam and Munich in April 1992, both works receiving the prestigious composition prize of the Ernst von Siemens Stiftung (Munich). A notable Royal Academy exhibition of Tibetan Buddhist sacred art inspired Clear Light, Magic Body for solo guitar of 1993, and his debut orchestral essay of 1994. Horse Tooth White Rock. Other majore scores form this period were in the natural of memorials: The Comfort of Angels for two pianos (1997), mourning the death of a gifted student at Oberlin Conservatory of Music, Ohio, where Vir was Associate Professor of Composition and Ultimate Words: Infinite Song, a 1998 Berlin Festival Commision for baritone and percussion, paying tribute to the humanity of Danish Resistance fighter Kim Malthe-Brun. Sympathetic to many cultural traditions, Vire works painstakingly to transform the revelations of his inner ear into dynamic, engaging sounds. His third opera, Ion, first performed complete by Music Theatre Wales in 2003, brought forth, in David Lan’s translation, a vibrant retelling of Euripedes’s elusive tragicomedy. With Vir’s most recent ensemble work, the BCMG-commissioned The Theatre of Magical Beings (2003), it reveals no let-up in the quality of his imagination, and a composer at the top of his form promising much for the future.